Click on the product for a closer look. The future of mobility is here! 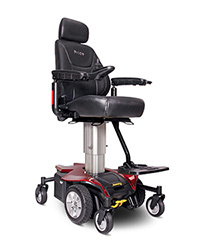 The Jazzy Air® elevates 10” in just 16 seconds, and safely drives at speeds up to 3.5 mph while elevated, allowing users to experience face-to-face social engagement. Jazzy Air empowers!